Aproximately 3 hours tour, inside of the biggest and most famous slum in South America and see the harmony and conviviality walking along the narrow streets, real contact with lifestyle and people living in the community where you learn about the history, culture and geography of the area. 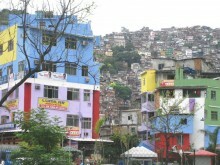 Rocinha (little farm) is located in South Zone between the districts of Sao Conrado and Gavea. Excursion with private guide in Rio de Janeiro. There are a number of community organizations at work in Rocinha, including neighborhood associations and numerous NGOs and non-profit educational institutions. I am mainly dedicated to organize local private and customized tours during your stay in Rio, with dynamism and safety. I invite you for an unforgetable experience in the "Marvelous City" !